Haint Blue originated in the deep American South. 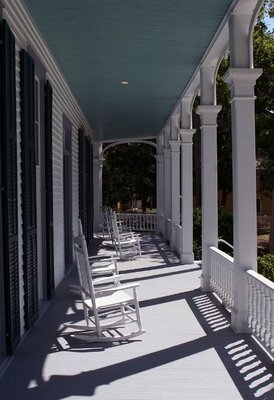 Today, in cities and towns throughout the south, one will find these blues and greens tints on shutters, doors, porch ceilings and windowsills, gracing many historic homes. 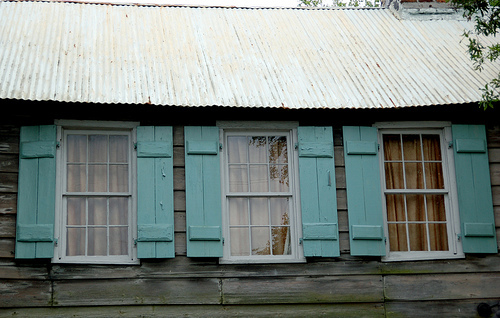 The pretty blues and greens compliment any grand old Victorian mansion, but the first painted strokes of Haint Blue adorned not the homes of the rich, but the simple shacks of African slaves. Known as the Gullah or Geechee people, the original Haint Blue creators were descendants of African slaves who worked on rice plantations in South Carolina and Georgia. Many of their ancestors came from Angola, which may be where the name Gullah originated. 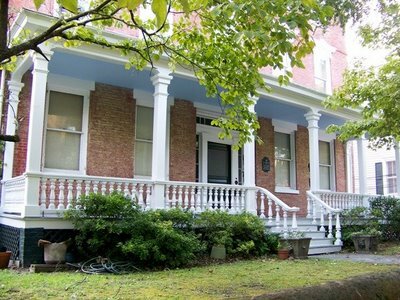 They are well-known for preserving their African heritage more than any other African American community. They kept alive the traditions, stories, and beliefs of their ancestors, including a fear of haints. Haints, or haunts, are spirits trapped between the world of the living and the world of the dead. These are not your quiet, floaty, sorrowful ghosts, they are the kind you don’t want to mess with, and the kind you certainly don’t want invading into your humble abode looking for revenge. Luckily, the Gullah people remembered an important footnote to the haint legend. These angry spirits have a kryptonite: they cannot cross water. The safest place would be in an underwater bubble, or perhaps to surround your house with a moat. But the Gullah people had a much more elegant solution. They would dig a pit in the ground, fill it with lime, milk, and whatever pigments they could find, stir it all together, and paint the mixture around every opening into their homes. The haints, confused by these watery pigments, are tricked into thinking they can’t enter. This belief was a key component in Washington Irving's tale of the Headless Horseman - and a common European superstition - that malevolent spirits cannot cross water. 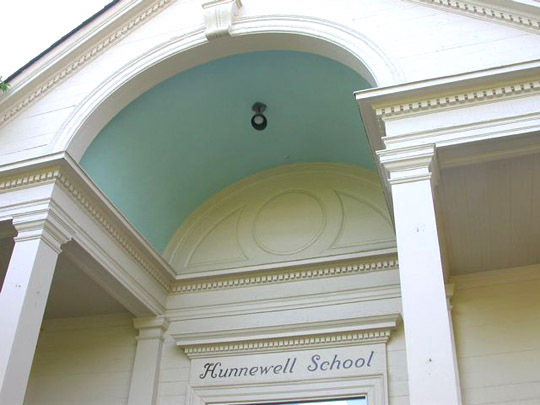 Hunnewell School, Wellesley, MA, USA. Image Source: Tilly's Cottage. Images Source: Kitchen and Residential Design. 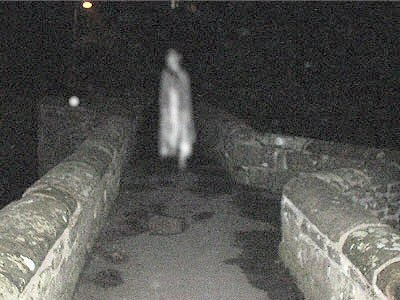 Superstition says spirits cannot cross running water, although there are plenty of tales of haunted bridges. Packhorse Bridge, Caergwrle, Wales, Cheshire Paranormal Society via Lifes To Short and BBC. also heard it definitely keeps away bugs!!!!! Hey, it's the boundary colour of this blog for a reason! I think it was the lime in the mixture that kept bugs away. Not the color. Proper spelling haunt blue. au pronounced as in laugh, Staunton,va., often aunt,etc. American Scots-Irish dialect. "haint blue"correct spelling 'cuz......it 'haint' blue & it 'haint' green ! No. That isn't right. It's Haint Blue. Hmm, where I'm from the belief is that spirits cannot specifically cross seawater (not just any running water) because the Goddess Mami Watta would not permit it (another important reason why the Gullah community remained near to the coast). The importance of blue is still relevant throughout the African diaspora today. @(9:46)Anon, in Savannah and other southern coastal communities they say the word haint. Haint is a variation of the word haunt that slaves developed in vernacular, so it is the proper spelling. Painting a ceiling blue was said to keep carpenter bees from tunneling. Apparently they get confused and think it is the sky. 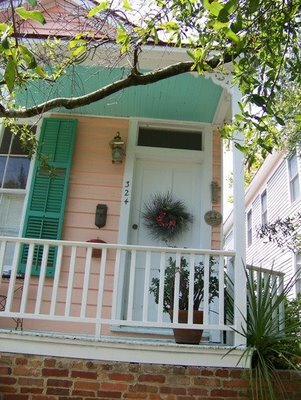 I thought the Haint blue tactic was to paint the door and shutters to keep the spirits from passing through. Definitely pronounced and spelled "haint" here in Georgia, not "haunt." Of course, most of us also call our "Aunt" our "Ant." Regarding the pronunciation, remember that Sheriff Andy Taylor called his aunt "Aint Bee"
Your explanation has made the most sense of all the websites I found when looking for the reasoning behind painting the porch ceiling blue.